Use Visualizer for schematics to assess the test coverage/impact of boundary-scan early in the design cycle. Add test coverage data from complementary test systems (functional, ICT, flying probe etc.) and view combined assessment through Visualizer. Use Visualizer for layout in production test systems to highlight data from the boundary-scan diagnostics reporter (BSD). Integrate Visualizer into bespoke test executives with the Active-X version also included. Imports and displays schematics and layout data from most manufacturers, such as Mentor, Cadence, Altium, Zuken, Valor, etc. Link to Vizualizer layout or schematic direct from ProVision netlist explorer, fault coverage examiner, boundary-scan diagnostics reporter and more. Fully customizable display modes for net colors highlights etc. 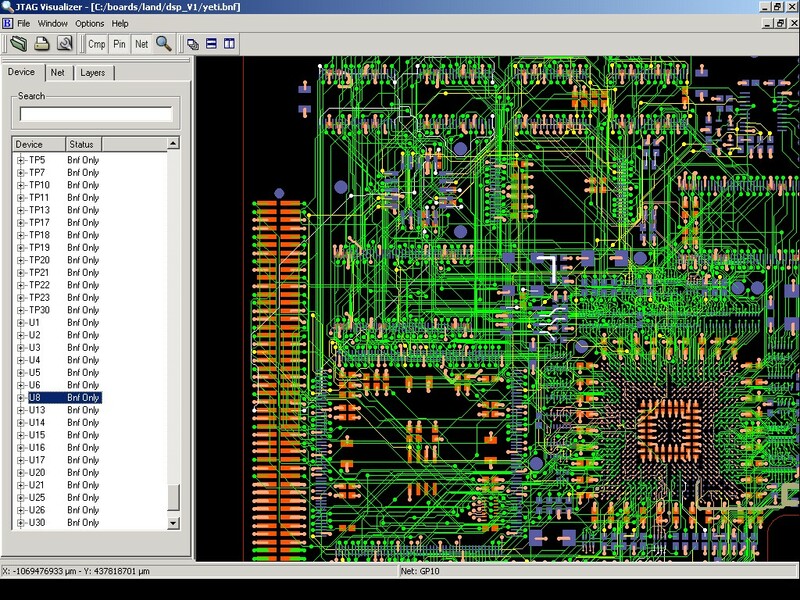 Cross-probing between layout and schematics at component and net levels.